These simple patio container gardens are the best option when garden space is sparse. Take your garden from now to wow! Make your small patio garden come alive this summer by using a variety of different sized pots and containers to add the right pops of color. By choosing pots and containers of different heights and widths and filling them with the right color combination of flowers, fresh herbs and vegetables, you can have the small garden you may not have thought was possible. I chose plants in different colors to coordinate with the colors of my pots. A whiskey barrel provides the depth for those plants that spread their roots. 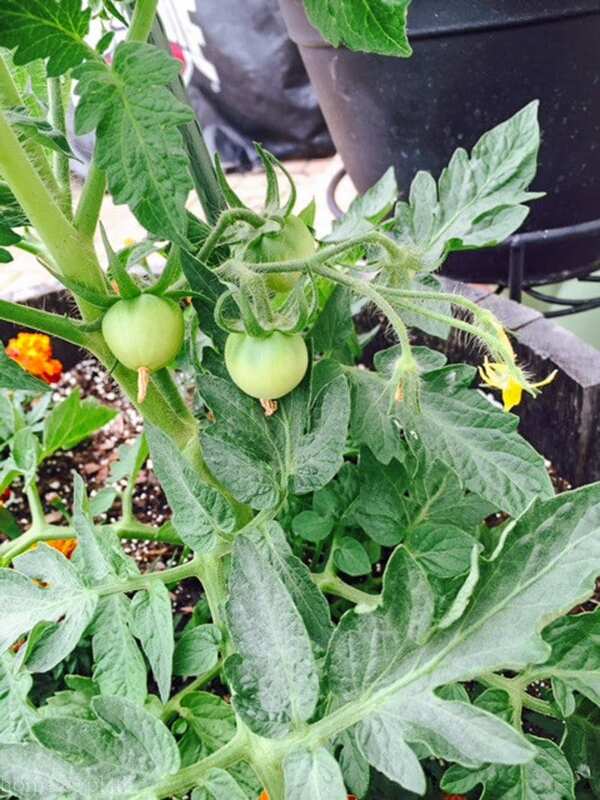 A vegetable garden just isn’t possible in my yard so I rely on simple patio container gardening to grow fresh tomatoes and eggplant each summer. 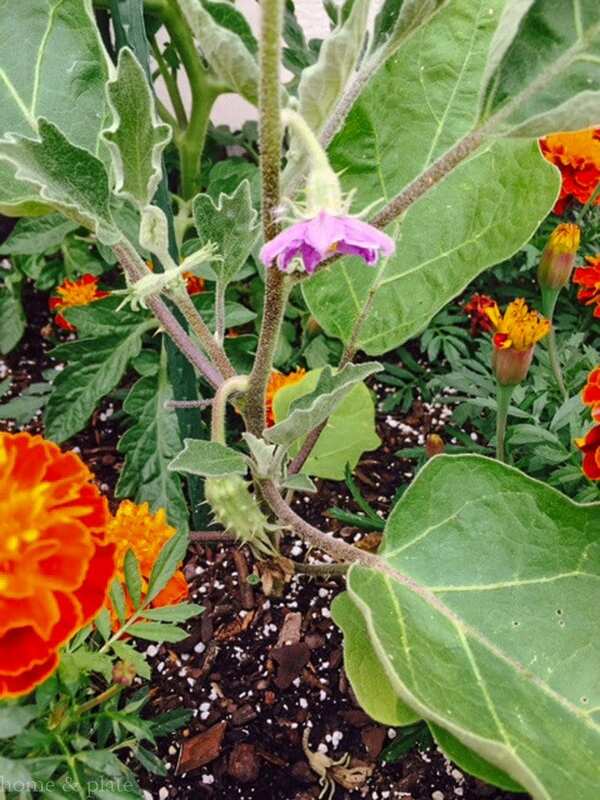 I plant companion herbs and flowers along side that I can use in my cooking. I chose a sunny spot that gets eight hours of sunlight of day. 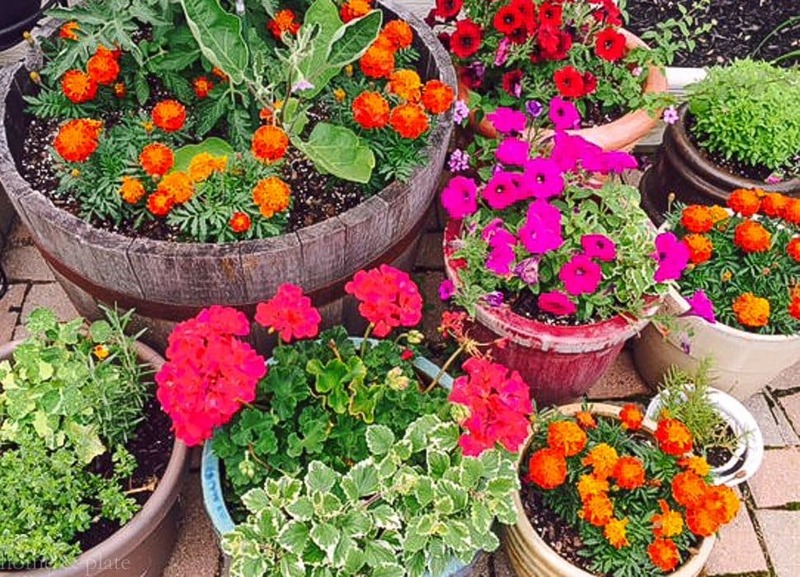 Regular watering, pruning and deadheading keeps my container plants looking full and colorful all season long. I purchased organic potting soil and put these babies in the ground around Mother’s Day weekend. In four weeks they look like this. Make sure you use a fertilizer if you opt for a generic potting soil. I’ve got one eggplant already growing and multiple tomatoes. One is even starting to turn yellow. I made sure I had plenty of marigolds to keep the critters away. So far so good. I also planted colorful nasturtiums, which are edible, alongside rosemary and thyme for a pop of color. 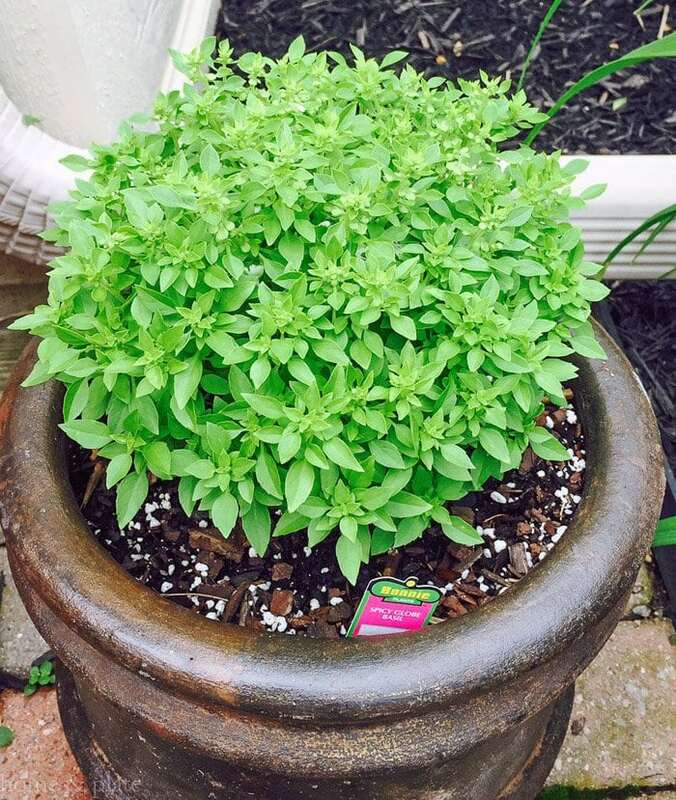 We use a lot of basil during the summer, so I dedicated one pot for this fragrant herb. 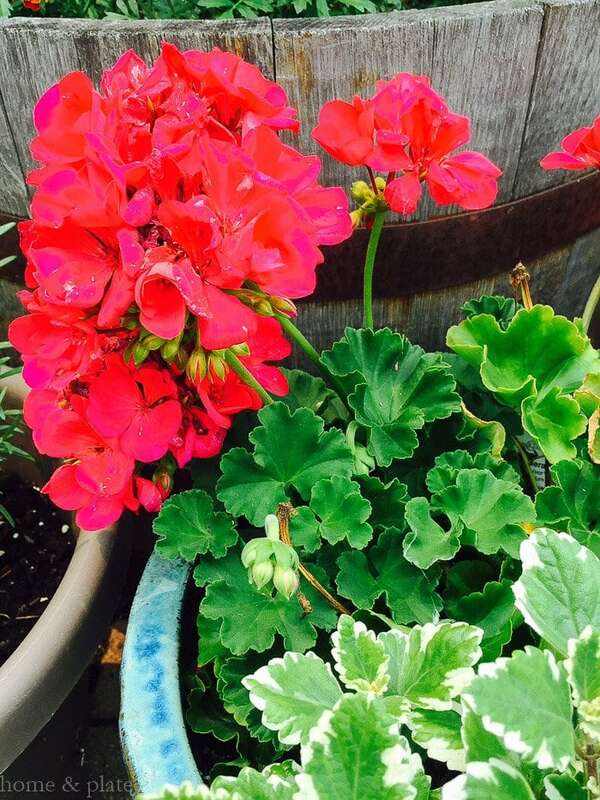 Easy-to-care-for flowers like geraniums and petunias, in vibrant purple and pink pair beautifully with lantana, verbena or even variegated ivy. As long as you have the right potting soil, a variety of different containers and slow-release fertilizer, planting a container garden couldn’t be easier. What have you planted this summer? We have all our herbs in containers on our deck this year! Makes it easy to get to them, and the greenery is great! I agree. Nothing like a splash of color to brighten summer. Wow, they all look so beautiful!! Beautiful garden! I love container gardening. I have herbs and tomatoes growing on the container this year. Thanks. I love homegrown tomatoes every summer and there is nothing like being able to pick your own herbs for your cooking.